Give Them a Voice: Chief Storyteller of Dogs I Meet, Mindy Dutka, is on a mission to give a voice to the countless unseen animal welfare organizations around the globe. 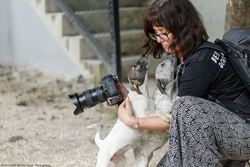 In her first successful excursion, Mindy recruited five of the industry’s top photographers and two of the most influential animal advocates to tour and photograph two animal rescue shelters in the Mexican Yucatan Peninsula. She explains, “I wanted to connect top animal photographers and powerful animal advocates with the forsaken animals and the people who rescue them". Dogs I Meet believes every dog has a tale. Chief Storyteller, Mindy Dutka, roams the globe in search of every dog’s story. With Boston as her home-base, she photographs family dogs, out-and-about dogs, and shelter dogs. Touted for her storytelling and dogged documentation by the likes of branding expert Working with Dog, Mindy’s mission is to honor family dogs, capture invincible bonds, and inspire animal advocacy.